The Dicecapades® franchise continues to grow. First there was Dicecapades® classic, then Dicecapades® Word Pirates, and now we have Dicecapades® Number Ninjas. 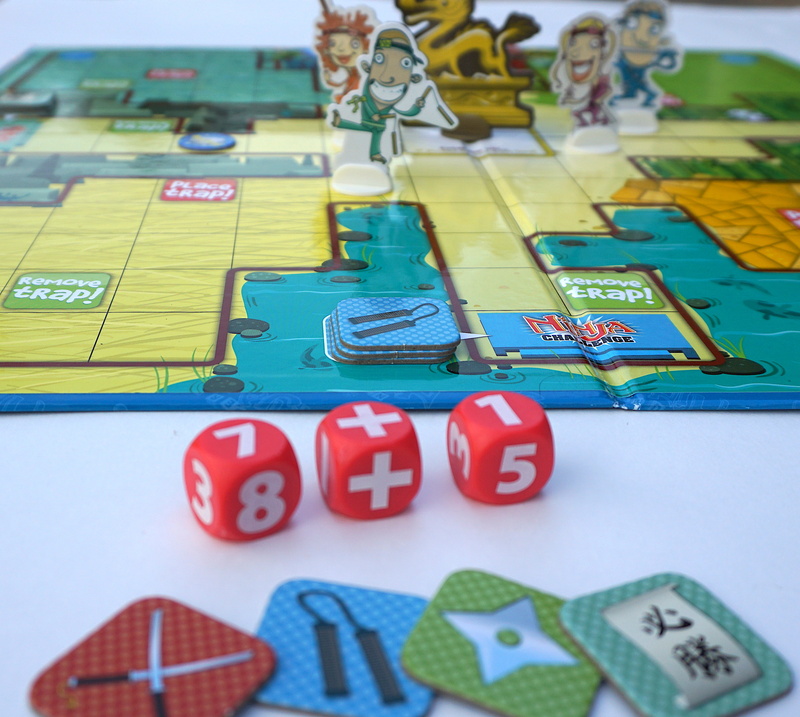 Add, subtract, and multiply your way to victory with Number Ninjas, a Dicecapades® educational game from Haywire Group. 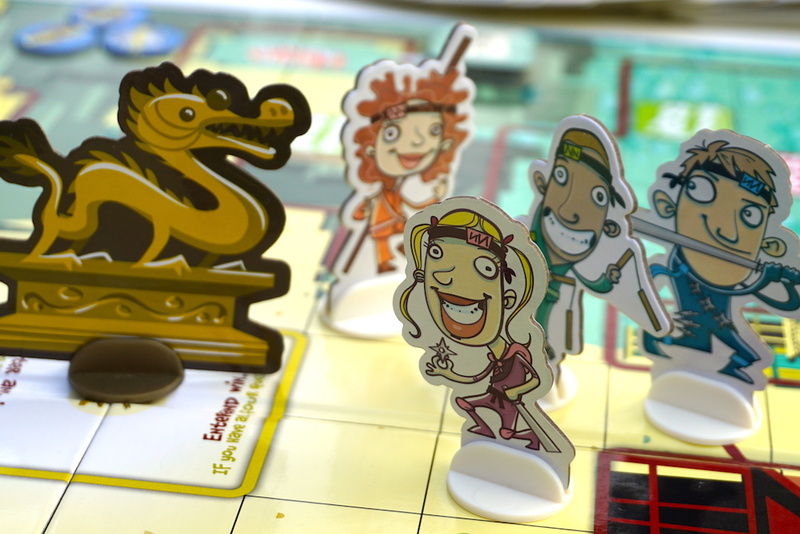 You and your fellow players are ninjas, competing to collect four quest items and race to the Golden Dragon. Each player begins by deciding if they are a Ninja Recruit or a Ninja Master. Recruits only need to do addition and subtraction, while Masters will also use multiplication and division. 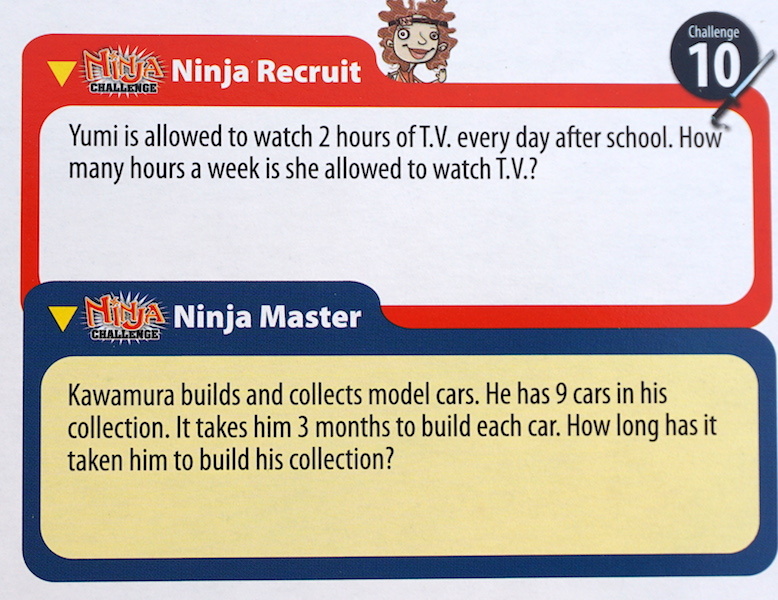 Ninja Masters can (in theory) move across the board faster, but will have to answer harder math questions. Begin your turn by rolling the red (Recruit) or blue (Master) dice. Add, subtract, or multiply the numbers on the dice; then move your Ninja that many spaces. When you land on a “Ninja Challenge”, you answer a math word problem. Answer correctly to receive the quest item for that space. While traveling from quest to quest, players may decide to make a detour, to a “Place Trap!” space. Land here, and place a trap that completely covers any one square on the board. No one can go over or through a trap, but must go around it. If a player can’t go around the trap, they will need to travel to a “Remove Trap!” space to remove it, instead. You must travel to the four “Ninja Challenge” spaces and answer the challenge questions correctly. Once you have received the four unique quest items, you may finally travel to the space at the center of the board, the Golden Dragon. If you are the first player to complete this feat, you are the ultimate Number Ninja. Number Ninjas is a cute way to practice arithmetic. 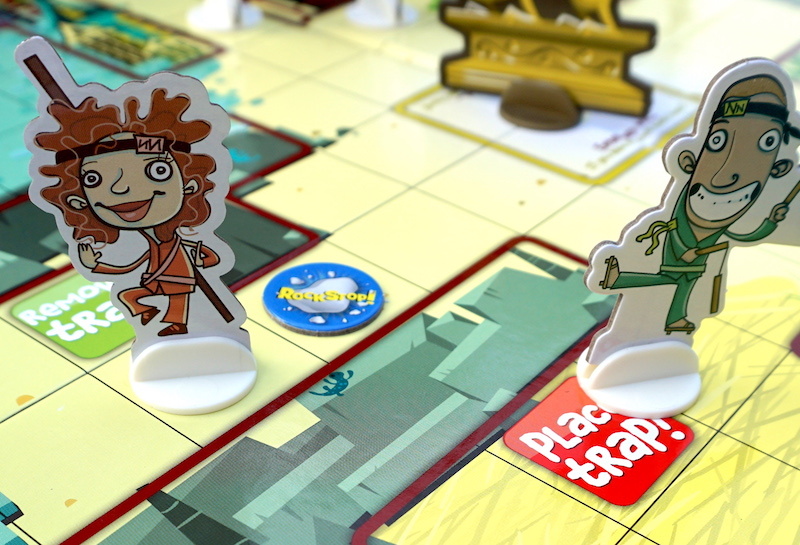 Everything in the game follows the ninja theme – even the word problems – so it is guaranteed to catch the interest of any ninja-loving kid. I loved the idea of applying arithmetic as part of the dice rolls. Unfortunately, the gameplay means that progress is mostly determined by luck. Roll unlucky too often (1 – 1, 7 x 0), and you’ll be unable to catch up. Although older players should be able to move faster with the blue “master” dice, the numbers are weighted toward smaller results. As a “master”, I often found myself moving only 1 or 2 spaces while the “recruits” moved 7 or more. The traps can be played strategically, but the “place trap” squares are out of the usual traveling paths. A player who wants to block their opponent may slow their own progress as well. Placing traps has another pitfall, too: in theory, two opponents could team up to trap a third player on a Ninja Challenge space and deny them access to a way to remove the trap. We did not allow that in our gameplay. Our first-grader loves ninjas, and could manage most of the “ninja recruit” word problems. He asked to play Number Ninjas several times. Our fourth-grader did not enjoy the game. The “recruit” problems were too easy and she became frustrated at the results of her dice rolls. This would make a great classroom game for elementary school kids, although it only allows for 4 players at a time. Probably the best use is for practice of word problems in a less-threatening setting than a worksheet or written test. Number Ninjas fits a sweet spot, and parents will love this game if their lower elementary school aged children are fans of ninjas. 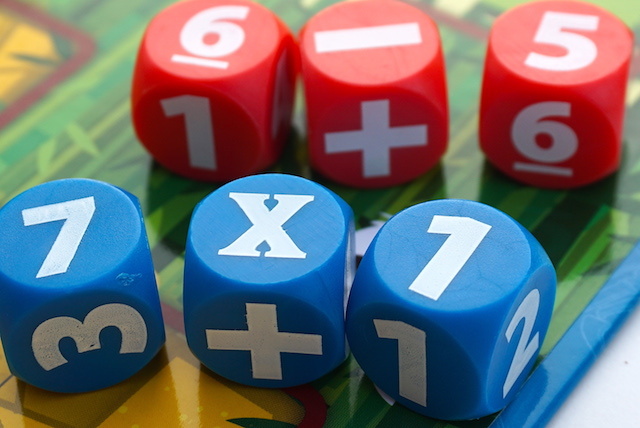 For us, we saw the theme drive the gameplay and get our first-grader interested in playing the game and engaging the arithmetic. The game does also allow for some room for growth, upgrading the difficulty from Recruit to Master, so if the kids in your life are at the younger range, you can get several years out of this game. In all, it was fun, but Number Ninjas definitely has a limited audience. If the kids in your life need arithmetic practice and love ninjas, look for it on Amazon or at your local toy store. The Family Gamers received a review copy of Number Ninjas from the Haywire Group.